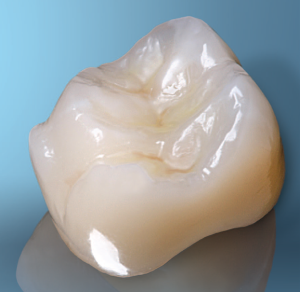 Lava Ultimate restorative is the world’s first resin nano ceramic CAD/CAM restorative material. A resin nano ceramic has an elastic modulus that’s comparable to dentin—which is much lower than what brittle glass ceramic materials or PFM veneering porcelains provide. This enables Lava Ultimate restorative to better absorb chewing forces and reduce stress to the CAD/CAM restoration. This is especially advantageous for crowns over implants. A tooth is naturally protected by the flex of the periodontal ligament, but the implant procedure removes the ligament, leaving no shock absorbance or sensory function—so the crown may fracture or chip. Lava™ Ultimate Restorations must be bonded with adhesive resin cement. 3M ESPE recommends RelyX™ Ultimate Adhesive Resin Cement with Scotchbond™ Universal Adhesive, a primer, and adhesive in one bottle.